SAVAGE CAT FOOD® – Increase your cat’s health and longevity by feeding a raw prey-based diet. BY FEEDING A RAW PREY-BASED DIET. Cat food today is marketed to the health conscious human. Advertisements including “açaí berry” and “sweet potatoes” sound healthy to us but leave our carnivorous cats with little nutrition. Historically, cats have never cooked their meals. Instead they receive nutrients and moisture from their prey. The lack of moisture in dry food takes a toll on the cat’s digestive system and can lead to a number of health problems, as serious as urinary or bladder stones. Feeding Savage Cat Food® significantly lowers the risk of diabetes and Feline Lower Urinary Tract Disorder and can help manage weight as well. Canned diets retain moisture but lack certain digestive enzymes, bones and organs that cats would normally eat in the wild. Even “grain-free” cat foods may contain useless fillers such as potatoes, carrots, peas and avocados. When a cat eats exclusively Savage Cat Food® you will notice considerably less waste and smell in the litter box, a softer healthier coat and increased oral health. 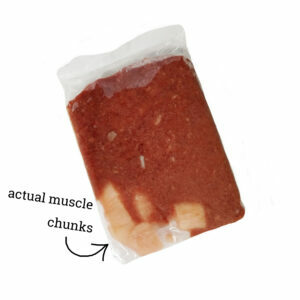 Savage Cat Food® is full of actual muscle chunks, such as diced chicken breast. The chunks are not unknown by-products or soy pressed into cubes. Savage Cat Food® contains real animal bone and marrow, the nutrients of which cannot be fully replicated with eggshell. Savage Cat Food® is not subjected to High Pressure Processing, which can damage helpful bacteria and change the taste of foods. Our food is packaged in 1-2 serving sizes. This eliminates the need for a scale and minimizes the amount of time raw meat is in the fridge. Our square box is efficient for freezer storage space, both at home and in retail display. Whole chicken with bones*, chicken heart*, chicken liver*, certified organic egg yolks, water, psyllium husk powder, wild salmon oil, taurine, vitamin E, vitamin B complex, adrenal tissue, spleen tissue, thymus tissue, pancreas tissue, salt. Whole rabbit with bones, lamb heart, lamb liver, certified organic egg yolks, water, psyllium husk powder, taurine, vitamin E, vitamin B complex, adrenal tissue, spleen tissue, thymus tissue, pancreas tissue, salt. Where is your meat sourced from? Our certified organic, free-range and antibiotic free chickens, chicken hearts and chicken livers are sourced from Petaluma Poultry, CA and Pitman Farms, CA. Our sustainably raised rabbit is raised in Paso Robles, CA and fed a corn-free feed. Our lamb hearts and lamb livers come from Superior Farms, a certified humane farm in Dixon, CA. Where is your salmon oil sourced from? Our salmon oil is sourced from Wild Alaskan Salmon that are harvested off the coast of Peru. Is the cat food grain free? Yes in regards to traditional grains. We include psyllium husk powder, which is an ancient super grain that acts as a non-carbohydrate fiber that replicates the fiber a cat would normally receive from it’s prey’s fur, teeth and claws. Cats are obligate carnivores: they require meat to live and have difficulty digesting plant matter. Fruits and vegetables are good for omnivores such as humans and even dogs, but are completely useless for cats. We designed our food specifically for cats and do not believe in cheapening our product with produce that is ultimately unused by cats. Why not add kelp or algae? Kelp and algae are found in some cat foods as an additional source of vitamins and often added as a supplement to low quality meat or boneless meat. We start with the highest human grade, organic meat with bone because we believe the nutrients in bone marrow cannot be replicated by anything else. Kelp and algae are not only far from what a cat would naturally eat in the wild, but they can have a taste, smell and texture that can be off-putting to some cats. A cat’s digestive system is built to handle much more bacteria than a human’s. Raw meat is perfectly safe and natural for a cat to eat, as they would in the wild. Raw bones are flexible and safe for chewing, but if cooked can become brittle and dangerous. We never recommend cooking the food. There is some misunderstandings about the safety of raw meat stemming from the FDA. The FDA does not recommend raw, but if you read their warning closely it is because raw meat poses a risk to humans, not to animals. We always recommend washing dishes, surfaces and hands thoroughly when feeding raw cat food. We also do not recommend eating the cat food yourself. 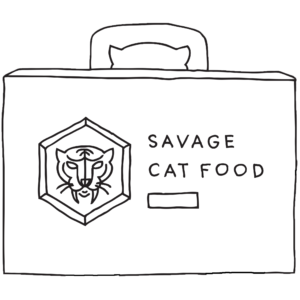 Savage Cat Food® will last up to one year in the freezer, or three days in the fridge. If your cat eats dry food start by transitioning from dry to canned: Put your cat on a closed feeding schedule with their current food. This means your cat eats one or two meals a day and does not eat freely in between meals. Getting them in the habit of eating once or twice daily will help them recognize new food as food when transitioning. Depending on how strongly your cat is addicted to dry food, you can start to work in wet food over the course of one to four weeks. Start with as much as 90% dry food and 10% canned, working your way to a higher percentage of canned food over the next couple of weeks. From canned to raw: Once your cat is on a closed feeding schedule with canned food you can start working in raw food. Start with 25% raw and 75% canned, working your way towards more and more raw food. Fully thaw Savage Cat Food® to room temperature or slightly warmer under warm water, and serve a meal twice a day. Raw food has less scent than cooked so it may take a while for your cat to recognize it as food! Discard any food that is not eaten with an hour. Clean serving dish (we recommend stainless steel or glass) after each meal. Use soap and water to wash all surfaces that come in contact with the food. Thaw two servings in the refrigerator. Run one serving under warm water, do not microwave. Repeat the process later in the day. Move next day’s servings from the freezer to the refrigerator. Once on a closed feeding schedule, top Savage Cat Food® with your cat’s favorite food for 1 to 4 weeks. Use fish sparingly, as it can be addictive. Instead of thawing Savage Cat Food® overnight, take it straight out of the freezer and run under warm water for a few seconds. Feed partially frozen to slow down scarfing. To feed small amounts of Savage Cat Food®, slice the packet while still frozen, place the small amount in a dish to thaw and return the remaining amount to the freezer. You can reach us through email here.